The all natural choice for conscientious pet owners. Treat your four-legged family member to a bath that is good for their coat, and skin. 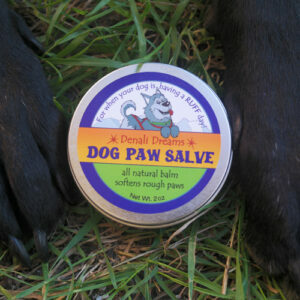 Naturally hypoallergenic we add neem and castor oil to soothe itchy skin and allows their coats to shine. The essential oil blend of peppermint, wintergreen, and cedarwood repels bugs and the scent will help remove those stinky smells that pups love to roll in. A 3.3 oz bar of Dog Wash soap. Option with a brown oval soap lift. After years of trying various medicated shampoos on our lab with skin issues, including shampoos prescribed by 3 different vets, I was astounded at the great results of your soap. I just ordered a bunch more bars. After 3 days, the dog looks great, doesn’t smell, and is not scratching. I know 3 days doesn’t seem like much, but compared to previous shampoos, it is a marked improvement! This soap is amazing. Our dog likes to smell like a dog, but if he’s to share our home, he has to have baths. This smells great and lathers fabulously. We were given one as a gift, now we give them as gifts to our doggie friends. We bought this soap for our dogs last summer when we visited Alaska. It’s the only thing we use now! It smells wonderful, and works great on both long and short coats. I’m ordering 4 more right now. One for us, and 3 as Christmas gift for our doggie relatives! I forgot I bought this soap when I was in Alaska. I tried it on my dogs and I loved it. It lathers nicely, and rinses off easily. My dogs hair was squeaky clean. There was no perfume smell that other dog shampoos have, and their fur was soft and fluffy.